1. Contracting: In the beginning of the year, I ask my students to create a set of class conduct rules that they will abide by and hold themselves accountable to as a group. I ask students to envision what an ideal learning environment would look like and what they can personally do to create it. I have students state their ideals in the positive, for example, "Listen before responding" instead of "Don't interrupt!" I let the students know that we can amend, delete, or add any agreements as the year progresses, based on the will of the group. The best thing about these rules is the sense of ownership the kids have about the process. It helps the students to see the class as one cohesive unit. They know that these are OUR rules. This is what WE believe is important! Click here for more information about contracting. 2. Identity Unit: The first unit in any class I teach, regardless of course topic, is on identity. My opening message to all students is, YOU BELONG. I explain to my students that each of us wants to be known and seen for who we really are, and that while we all know that we are more than what our exteriors may project, often times we don't apply this same understanding to others. I ask my students not only to take a chance in putting their authentic selves out there, but to also risk having their opinions of others challenged and changed. I have my students do activities such as "I Am" poems and "Bio-poems" and we share these in a gallery walk. It's important to note that I always do these activities with my students and I share my poems in the gallery walk as well. By putting myself on the line too, I send the message that ALL of us are engaging in the self-learning process and that all of us are expected to learn from one another. 3. 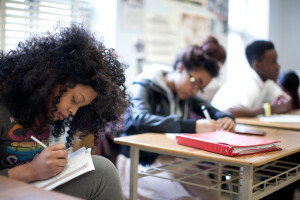 Journaling: When students engage in journaling, not only does it allow kids to reinforce their writing skills, but it also provides them with a safe space to process complex ideas or work through their thoughts about disturbing issues. I've found that when teaching difficult topics (for example the impact of racism or the horrors of genocide), students really appreciate having a few minutes to reflect and respond on paper before they are asked to contribute to a larger class conversation. Journaling gives students the opportunity to question, to contemplate, and to look inward without having to be evaluated by their peers during the process. 4. "Silent Conversations": I love to use classroom activities such as "Big Paper" and "Gallery Walks" because these methods invite students to communicate with one another on a whole different level. 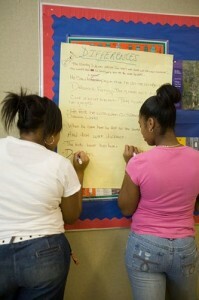 Big Paper allows students to dialogue with one another in silence, by writing comments on a large poster-sized piece of paper. Students who might not be particularly vocal in class often feel freer to contribute to conversations structured in this way. And, I've noticed that when I post student works such as poems or six-word essays and ask the group to do a silent gallery walk, the tenor of the class always changes. The silence seems to promote a sort of reverence for the work and the students tend to be very appreciative of their peers' efforts. The pace slows down, and as students read each piece of posted work, everyone is validated in their "voice" being heard (albeit silently) by the entire group. 5. Giving Equal Time to All Voices: Class discussions are important in any class, but including strategies that guarantee each student a chance to voice his or her ideas and opinions also contribute to students feeling respected and safe. Activities such as "Save the Last Word", "Human Barometer" and "Four Corners" provide structures for participation that are non-threatening and encourage active listening. I've also employed "Talking Circles" to make sure each student had an uninterrupted opportunity to speak to the entire group. 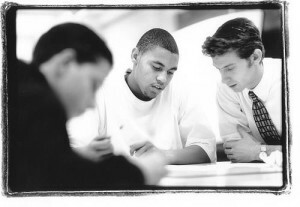 When educators use classroom techniques and strategies that promote ownership of one's learning, validation of one's identity, time for self-reflection, expectations of active listening, and opportunities for engaged participation, everyone reaps tremendous rewards. Not only will your students feel safe and respected as individuals, but they will likely see their class as a distinct community and feel a sense of cohesion and belonging. And once students feel safe, they are much more willing and able to take intellectual risks and truly engage in the learning process. How do you create a safe classroom space? How will you build a sense of community in your classroom this year? 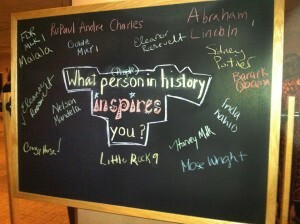 CLICK HERE for more back-to-school ideas from Facing History and Ourselves.